The University District Community Development Association, Inc. (UDCDA) has been awarded a $125,000 grant through New York State Homes and Community Renewal’s (HCR) Buffalo Main Streets Initiative (BMSI). 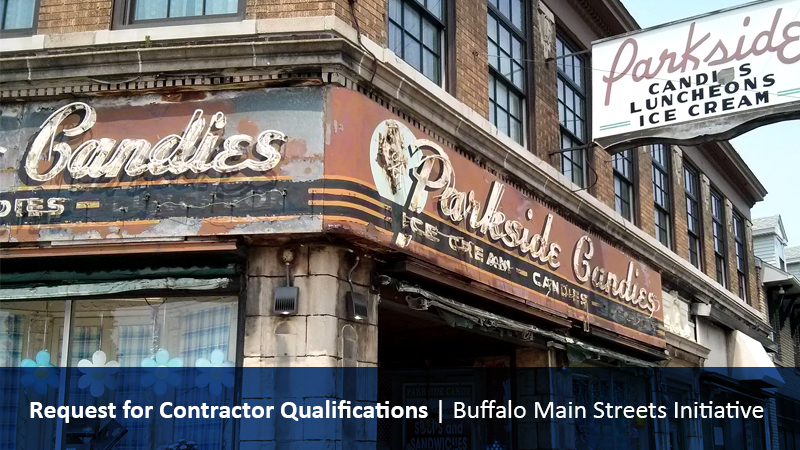 This grant allows us to assist the owner of Parkside Candy, a historic landmark and neighborhood anchor located on Main Street in Buffalo’s University Heights community. The UDCDA is assembling a list of general and specialized contractors interested in receiving bid opportunities to work with the property owner on building renovations. Renovation work includes but is not limited to health and safety improvements, remodeling upstairs apartments, running new electrical service, window and door replacement, detailed painting and plaster work in historic commercial space, exterior neon signage, facade repair, and installation of new awnings. Contractors wishing to be considered for inclusion are required by New York State to submit a letter of intent. You can fill out the electronic form below or download a PDF of the letter of intent and email/mail/fax it back to our organization following the instructions on the letter.